Chocolate is one of the most delicious treats ever, and it deserves its own special day to enjoy, isn't it? Every year all chocolate lovers around the globe celebrate World Chocolate Day on July 7. There are many dates around the year promoting variations of Chocolate Day. Many chocolate lovers state, that July 7 is a real Chocolate Day to be celebrated around the world or, at least, in Europe, since the history of this holiday is connected with the history of chocolate in Europe. The food historians state, that modern chocolate bars were introduced in Europe on July 7, 1847. This invention belongs to Joseph Fry, an English chocolate maker. 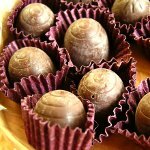 He was the first to add melted cacao butter to chocolate to make chocolate moldable. The first milk chocolate appeared in 1857, and since then many chocolate makers started a long way towards improvement of its texture and taste to make a perfect bar. The history of chocolate is very long and complicated, chocolate itself saw rises and falls, it was adored by public and banned by the church. And still we all love chocolate for its heavenly taste and number of flavors. Grab your favorite chocolate or give a try to the flavor you've never tasted before, and join celebration of World Chocolate Day.